I just posted a question about the most long lasting wood species for windows in the Windows Forum, then realized I actually have a larger question. When I was a child I lived in an agricultural area that was slowly being converted to residential, and saw a number of old abandoned farmhouses torn down. They were not architectural wonders, but the process made me sad, once-loved things passing away. It filled me with an abiding urge to build things well, and maintain them for a long time. To this day I love old houses. But I don't think that for the most part we are building houses that will endure long enough to be old one day. To be honest, neither did our ancestors, as there are not really all that many houses around that are over 100 years old, and far fewer that are over 150. But suppose someone wanted build such a house, one to pass down through generations. How would that person go about it? What materials? What techniques? Timberframe rather than balloon framing? Someone told me that in parts of Europe plumbing is made of stainless steel. If true, this is astonishing. I live in a state that's less than 150 years old, so it's not at all surprising that there aren't that many homes over 100 years old. As someone who does a lot of remodeling of older housing stock, I can say that current housing is being built to much more rigorous standards. Tract home developments in our area are required to have energy ratings in the low 50's, meaning they use about half the energy of the same home built to 2006 Code requirements. Likewise, building science has advanced significantly. Current new construction is much stronger, safer, energy efficient and healthy than homes that were built a couple of decades ago. A house built today should easily last a century or two. The answer is simpler than you think. Houses do last a long time but they require maintenance even if built of the newer low-maintenance materials. My house was built in 1891 and its not the oldest house in the neighborhood. The framing is first growth so it cannot be replicated but houses don't deteriorate from the inside out; its the exterior that fails from exposure to the elements. People will repair the cladding and roofing and windows if the design and location of the house is desirable and the nature of the community doesn't change. Its the community that can't be stopped from changing. 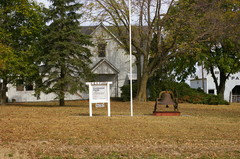 The old farm buildings were no longer valued to the community so they were removed. What has made maintenance more difficult is the increasing cost of heating and air conditioning which resulted in insulation and vapor retarders being added to wall cavities and the advance in materials that led to the substitution of structural sheathing (plywood & OSB) for horizontal boards. These changes reduced the movement of air and water vapor from inside to the outside of the walls and made it necessary to design walls more carefully. I won't open that can of worms but it has become a complicated and expensive endeavor to prevent moisture from destroying the walls of a wood framed house. PVC is the modern miracle material that doesn't deteriorate until it loses the plasticizers that prevent it from cracking. Cast iron is better and more expensive but a good design doesn't need much of it. The bottom line is that the parts of the house only need to last as long as the community needs the structure. People don't pass things down to their family as they once did and the density of communities is slowly increasing forcing out large single-family houses in favor for condominiums and apartments — urban spread. I predict that because of its location and great design, my house will be one of the last to be replaced if it is owned by increasingly wealthy people which seems likely. Yes, it was well built but more importantly its a beautiful building even after many good and bad additons. My grandfather built a frame house in Houston, TX around 1913 - my grandparents paid for the land, building the home and furnishing it for $2000. As far as I know, the person who purchased the house around 1960 (for about $20K) still lives there - it is now valued at around $300K. Houses last as long as they're economically viable. When the market changes, or governments periodically turn to war or socialistic greed, the most magnificent well-built homes fall to the wrecker's ball. Succeeded, eventually, by this undistinguished tower. 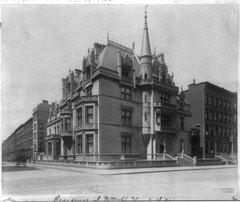 Cases in point: the Gilded Age Manhattan mansions demolished to make way for anonymous office towers. In the UK, centuries-old country homes were fallen into neglect and ruin as the owners could not afford their upkeep with the passing of the old order of landed wealth and new egalitarian measures such as 90%+ income taxes. To avoid probate taxes, some owners simply demolished the homes. At least 1,200 country estates were leveled, their furnishings gone round the world, art collections dispersed. 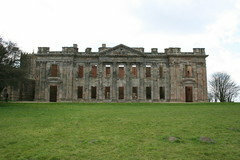 Sutton Scarsdale Hall, b. 1729. Roofless and ruined since 1919. I'm starting to see some serious deterioration in subdivision houses built in a very desirable part of my town. Most were built in the '60's & '70's, but a few even in the '80's. They were fairly inexpensive when built as this is a LCOL area and at that time, was even lower. I doubt if any of them cost $100,000 when built. They are 2-story, 3 BR 2 1/2 bath houses with a LR and family room. The problem is that they were NOT well-built, exterior or interior - they were "builder-grade" 100% throughout. And as they started failing, their owners did not have the money to fix them properly. Many stop-gap things were done. 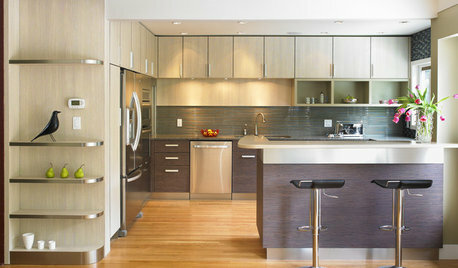 The kitchens became dated and were re-done using RTA cabinets that were utter garbage. Now those are falling off the walls. If it could be done cheaply, it was. They're mostly in a very desirable school district but are now hard to sell as they would require more to fix them up than they are worth. There is really no hope for these neighborhoods due to poor maintenance and initial construction. OTOH, my own neighborhood is a 1948 subdivision. A of the houses were built right before WWII (a row of them right across the street from my own house). All are classic center hall 2 story colonials. Even the ones (such as my own) that were built right after the War, were well-built houses. The baseboards are not quite as deep (7" instead of 9"), and the other millwork around doors/windows is just slightly narrower, but both are far superior to what one sees today (if they see anything at all!). All were built with clear oak, site-finished hardwood floors, and walls and ceilings were plaster, and baths were fully tiled. IE, quality construction. As a result, these house have been worth remodeling and adding additions and their value has sky-rocketed since we bought our house nearly 35 years ago. It's still a highly desirable neighborhood due to schools and close distance to downtown (about 15 minutes). There are no teardown in this neighborhood. At one time, my DS lived in Riverside CT. That community all went up right after WWII, and they were tiny little Cape Cod or 2-story Colonial houses. But they were NOT well-built - millwork was skimpy and the room proportions/sizes just said "cheap". As a result, the number of teardown in that neighborhood is colossal. Those that remain have had garages converted into family rooms (same as in my neighborhood), but these were front-facing single car garages with no room to add a free-standing at the back of the property (which is what has often happened in my own neighborhood). God only knows what will happen to all the hideously ugly snout houses being built all in a row, or the ones with multiple gables and a mix of architecture styles. When I see street after street of these, one can only hope that "urban renewal" will someday be done by Mother Nature in the form of a tornado that flattens them all so it can all be started over again. I agree. It's life laid bare. Gotta get back to the dream. Tennis, anyone? I guess it's particularly depressing for me, because like Rose, I'd like to build a long-lasting house. A really long lasting house. I'd like my children to stand a chance of staying in it, for as long as they need to (special needs). I don't even know if I'm going to be blessed with any grandkids one day, so I guess the house only needs to be serviceable for the next 120 years (my youngest is 1). Concrete, steel and glass. None of these should deteriorate. Spent a small fortune on windows, but even in the event that one of the triple panes loses it's seal, they can be reglazed fairly easily as the interior wood frame comes on with screws. Copper plumbing, MC cable, lots of conduit runs. Spare conduit under everything and out from the mechanical room. Ready for solar, generator. Also - it's on 15 acres, so unlikely to be "encroached on", and it's surrounded on 2 sides with a state park and some city / county greenspace. (I have first right of refusal on the land on the eastern border. and it's adaptable and reasonable for aging in place. 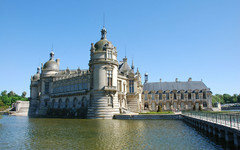 Very often, the more magnificent the building, the less likely it will long survive. 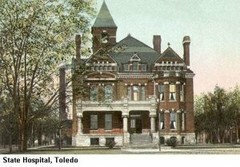 Here are some Richardsonian Romanesque institutional homes that I saw every day during my time at the Toledo State Mental Hospital when I counted my age on two hands. 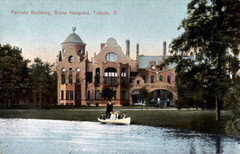 The many buildings and acres of landscaped grounds with at least two ponds, a golf course, a movie theatre and sports fields opened in 1888; closed in 1982 with all buildings eventually razed to the ground. Today, GC's build as CHEAP as possible to make the MOST profit!!!! It's ALL about profit!! I like to think the homes and cottages I design enhance the lives of those that enter through the doors and even those that see them. They are not fancy, in fact most of them are rather modest; but hopefully they are sited and laid out in a way that let the inhabitants enjoy their environment in a somewhat seamless way. Over time the people will change and attitudes will change, which will most likely change the architecture. But that is what the architecture is for. We try to design so they last forever, knowing that life is uncertain and change is inevitable. Some buildings last a long time for whatever reason and sometimes at great pains. I think they remind us of the way things were and what is possible at the same time. I'm not thinking on the grand scale of most of the pix posted here, but on "ordinary people houses". If you build in a neighborhood, chances are good that the neighborhood will change -- even if your house is still in fantastic shape. I'm thinking of the house my grandparents lived in when I was small ... beautiful all-brick four-square across from a church and some lovely public gardens. 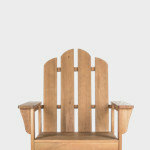 Hardwoods, formal rooms, big kitchen, sunroom and porches. However, that was a long time ago, and now they've four-laned the road in front, taking away half the front yard. It's become a place you wouldn't want to walk alone after dark. If well-maintained, I have no doubt it'd still be a lovely house ... but a couple years ago I drove by it, and the owners (renters?) had stapled thick plastic over the windows. 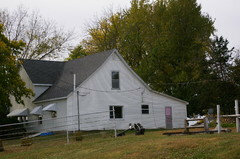 On the other hand, the farmhouse that my grandparents built during the 1930s is still going strong. It'd been added onto several times, but my brother lives in it today. For many of us the idea of a "forever house" or a "house for the ages" is simply a wishful longing. Unfortunately, life and circumstances around us have many unseen and unplanned bumps which may impact our lives, including the places and ways in which we live. Great discussion. This is something that is common in the U.S. but not so common in Europe where houses and neighborhoods hold their value much better. From the research we've done there are several causes. - Increasing numbers of people want to live in communities where they can safely and comfortably walk or bicycle to school, grocery, pharmacy, dinner, etc. Most suburban communities in the U.S. do not allow this making them less attractive to many buyers and so decreasing these homes and neighborhoods values. Communities outside the U.S. are designed to be more walkable/bikeable and so have not suffered from this. - Design of the week. Our house designs go out of style much faster. If the house we built in 2005 is no longer in style then it will be less valuable in 2019. Houses in Europe tend to stick closer to many classical elements and even as styles change the older styles don't necessarily go out of style. - Construction quality. Houses in Europe are expected to last for over 100 or 200 years and are built to that level. This often means cement formed walls or stone structures. On average they cost about 20% more to build but rather than a value of $0 in 60 or 70 years will be almost as valuable as a new home. They'll redo the interior but the exterior and the structure are good for hundreds of years. We've been watching U.S. suburbs closely for several years. With very few exceptions what happens is that they retain their value for about 5-7 years and then begin a slow decline. At about 22-30 years there's a significant decline (in current dollar value) and then back to the slower rate of decline. The fast decline at year 22 appears to be the changeover from mostly original owners to second owners. These owners are not paying nearly as much (in current $'s) and so do not value their house and neighborhood as much and do not care for it as much. 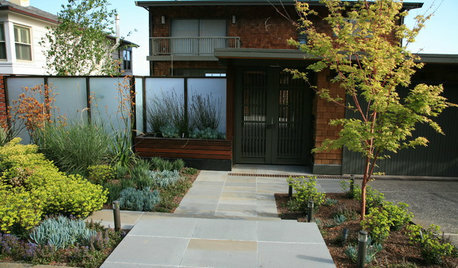 At 30 years yards and exteriors are not as well maintained. The neighborhood overall looks 'shabbier' and so people are not willing to pay as much. This is very different in The Netherlands for instance where neighborhoods do not see this decline. 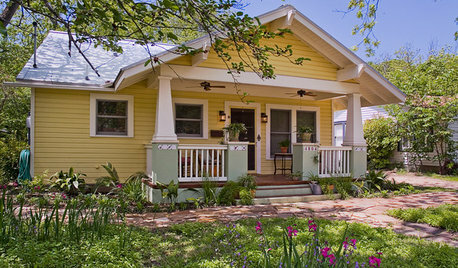 The neighborhoods retain their character and houses retain their value. That seems to be true with newer built neighborhoods but established neighborhoods with quality schools hold their value and even increase in value. The neighborhood I grew up in was established back in the 20's-50's and still holds its value as a very desirable area. Homes are "updated" and smaller ones are knocked down and rebuilt (or just renovated). Nothing looks shabby. But it's all about the schools. However I agree with you that the most desirable neighborhoods tend to have things like local shopping (think a small downtown area), parks, walk to schools, etc. In addition to school, around me lot size and overall location is a big factor, too. My brother just bought a house in the suburban neighborhood in which we grew up because it's one of the few remaining neighborhoods that are fairly centrally located while still having .25 - .5 acre lots available (the houses on larger spaces are sadly being replaced with multiple houses crammed in). In the entirely new neighborhoods, 5,000 - 8,000 square ft. lots are the norm. Having space for an actual backyard and not looking out your window into the neighbor's house a few feet away helps things retain value around me. My teenage "hometown" now gets publicity as a stronghold of MS13. Yet one famous schoolmate in one of his many interviews called it "the perfect place" to grow up. Same buildings. Different atmosphere. I think we need to remember that much of Europe is far more densely populated than the US, so it's not nearly as common to see sprawling suburbs with ginormous houses on huge lots there. Average house size in many European countries is half that of the US (in the UK it's about a third). So, expectations about house size and proximity to services are quite different, whereas Canada and Australia are more like the US. Not many people in Europe expect their houses to have big yards or bathrooms for every bedroom or two or three living/family/media rooms under one roof. Indoor plumbing aside, Europeans can live pretty happily in the homes and spaces their grandparents lived in, whereas we expect something twice the size, so we tear down the old because it doesn't meet our needs. I doubt the issue is as much the construction of the house as it is the nature of our aspirations. Well...kitchen areas with two islands, a space each for a living, family, exercise and media rooms, walk-in dual head showers and a claw-foot soaking tub, a his and hers walk-in closet, each of the other bedrooms (5 min) with its own bath and walk in closet, minimum of a 3-car garage, with all cars and trucks kept in the driveway, swimming pool, spa, BBQ and game space...and we wonder why folks tear down older houses and why no one lives like their parents? With any luck, they'll see how the increase in material things and house size somehow didn't translate to an increase in happiness, and maybe they'll value quality over quantity. Humans seem to swing between extremes, yes? I just hope I'm still around to see it! Just think, what if we have a great national architectural revival? What if post-McMansion architecture focuses on vernacular styles? People will get sick of the homogeneous McStuff, and want something with a more local flavor? Maybe? I wonder, too, about what future generations think they'll need. But I do know that average new house sizes have shrunk slightly here in Australia over the last decade, so maybe common sense will prevail! That, and changing demographics - smaller families, aging population, lack of job security, greater mobility. The notion of the family home being passed on to the next generation is fading away - and the "forever home" is a mirage. I hope reality will hit sooner rather than later, and people will start building for needs rather than wants (no one actually "needs" 20 foot ceilings and bathrooms bigger than my parents' living room was). Personally, I'm in the "build smaller but build better" brigade. My brick two and a half story 2700 sq foot Federal style house was built in 1793. My daughter lives in a house that started as a two story two room log cabin in 1753 and was “modernized” in 1843 to a two story 3000 sq foot Victorian cross gabled clapboard farmhouse. Like the idea of house for the ages. Old house cared for through all the years since it was built. My house needed restoration but had much original under the major 1950s updates. Original cedar shake roof was under four layers of modern roofing. Daughter’s house had been in original family through the generations until she bought it five years ago- land had been sold off from 150 acres to the two the house now has. My house has solid construction- brick walls are two feet thick. Original plaster. Daughter’s house clapboards are 1 1/2” thick. 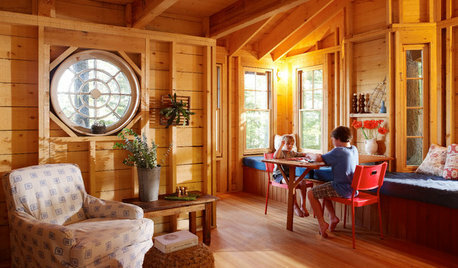 Log cabin In the plaster walls. My East coast area this construction for old houses very much the norm whether the house is grand or not. 1793?!?!? You have my congratulations and sympathy. We see value in maintaining and/or restoring houses about pre-1880 and somewhat up through maybe 1940's. Will people want to maintain/restore 2000's suburban mcmansions with fake fronts plastered on them? Will people want to maintain/restore 2000's suburban mcmansions with fake fronts plastered on them? I'm hoping people will want to give neo-eclectic houses a facelift, and *improve* the facade, rather than maintain the fakery. How is that even done, though? For example, in my subdivision, the HOA required 75% masonry on the houses, so builders put stone and brick on 3 of the 4 sides. Unless you were crazy (yep, I was crazy) and paid the extra $3k to brick the back -- which virtually no one did -- how would people fix this? The foundation needed to be poured with the added lip for the brick to sit on, so most of these houses don't have that lip across the back. The alternative, I suppose, is a faster-than-historically-done "tear down" movement of relatively new(-ish) houses, in order to do them "right." But the land will have to be really valuable. For most of the suburbs, though, I don't think it will. I fear that the value may plummet enough that one day, I will be able to buy the houses on either side of me, and ask the HOA for a variance so that I can tear those houses down and expand my yard. Not that I see myself doing that, specifically, but the thought had occurred to me, that maybe we will start to see folks wanting to reincorporate plots that were previously subdivided? It is sad to see a century farmhouse go. My husband and I had the option to renovate our old farmhouse on land our family has owned since the origination of the house. It is 185 years old and has withstood the test of time. It is a simple four bedroom one bath farmhouse. Our two bedroom log cabin is our current unattached garage. The only problem is the amount of money it would cost to incorporate our needs/wants would be more than we are able to afford and still have money to continue the farming legacy! We can get a larger, more efficient house for the money it would take to fix up the old house. You would need to strip it down to the studs, replace all of the foundation and add on to be comfortable. Also would have to rip out some trees, since they were too close to the house. We weighed our options and made a list of good/bad. 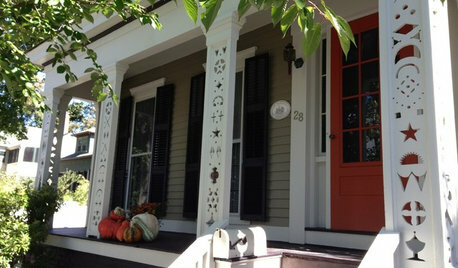 The good was the exterior, house placement, and of course its structure/history. The bad the basement foundation was failing as it was made of field stones, the basement took on water, windows were rotting, plaster was cracking, lead paint everywhere, electrical issues (lights that used to work wouldn't turn on), no air conditioning, baseboard heat, old coal furnace in the basement, extremely ugly white metal cabinets, one bathroom 5' x 7', stacked laundry unit which was in the bathroom closet. Every time it was 0 degrees the water lines froze, batch flies would come in by the thousands during the fall with the massive wolf spiders coming up through the bathtub and sink drains even when we sprayed for pests. We lived in the house for a year. Froze during the winter, went without water for several days, were annoyed to death by the buzzing of flies and sweat to death during the summer. If we spent 500,000 we would probably just touch the maintenance issues/replacement of leaking/rotting materials and still have an old house that was functional(saved) but not an ideal layout for our family. Even with all the bad it is still difficult to let it go :( It is like a death in the family; similar to watching that old 200 year old cottonwood uproot and die from the excessive rains we had three years ago. I appreciate your intentions so much. From a resource sustainability perspective building things the right way the first time will help to reduce the human footprint. We own a nearly 100-year old colonial revival which is two blocks from a major university. I usually walk to work or ride a bicycle. The house is significant in town since the head of the architecture program at the time designed it, and the best quality materials of the day were used. I have the original design specs and blue prints, which are very interesting to read and compare to today’s documents. Location, location, location is definitely true, especially in our case since major universities have permanence on the scale of millennia. But our neighborhood is always wary of developers and absentee landlords scooping up homes for student rentals. Our neighborhood is on the state’s list of historical places, and there has been talk over the past 20 years of applying for National Register designation. Also, we are lucky that there are senior faculty and administrators who want the ability to walk to work and who can afford it. Sadly there are few young families who live in our part of town. Keeping our house in order has required some big investments, and we put an addition on this year for a new kitchen. To maintain the external architecture, it was very expensive. 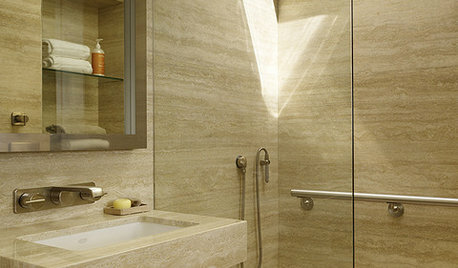 Also, while the rooms are generous size, it is the antithesis of the open concepts which most Houzzers seem to prefer. As only the 3rd family to own our house, we realize how lucky we are to call it home for our time in it. I just hope we can afford the taxes and upkeep long into our retirement! Photo of our house during a snowstorm this winter. The house across the street is colonial. I don't mean style, though that, too... but age. It was definitely constructed before 1800. It is in great shape, although two or three years ago the old stone foundation in front had to be re-enforced, which took nearly half a year to accomplish... everything eventually settles. They also remodeled some of the interior space... bedrooms were a lot smaller in colonial days and no one then had much need for storage. Wouldn't be surprised if lots of interior work happened over the two plus centuries. It's still not fully "modern" - when I was in there, the kitchen remained closed concept, just with the door removed. I know they had to do some other exterior work - the elements in Massachusetts do take their toll. They've also modernized the front door. My house, a log home, should last a good many years. I could probably have gone with a metal roof instead of asphalt - I expect in 25 years someone will add an additional layer of asphalt, and about 25 years after that the roof will be replaced. Depends on the owner. I'm rural, you can drive down the main drag through town, and there are a lot of really nicely-done homes, nothing huge or the like, but nice pieces of property, well-maintained without looking like suburbia. Some are older, some are newer (although I still have the newest construction in my town). And down further you'll see ramshackle things that the next good wind should take down, or very old lone trailers rusting into the landscape. I don't think we'll draw a large influx of people here... nothing is in walking distance except my chickens ;) But that does draw in a few of us. Anyhow, it isn't just maintenance, although that is a part of it. My first home that I owned was in a small condo complex of four buildings, 12 units in each. I happened to go to one of the other buildings to use the laundry machines (the complex "maintained" coin operated ones in each basement) there was a huge crack/gash in the foundation wall that let water rush in during bad storms. The buildings had been constructed in the late 50s and this was early 80s. So, less than 30 years, shoddy building. Louisville, CO is a former mining town that has become a charming place to live. The town regularly makes lists of the best places to live in the U.S. The most desirable part of town is near downtown. Unfortunately, this is the area where the miners' homes were built before indoor plumbing. I've been brought in to consult on possible remodels and additions to some of these homes. I've had to tell the owners that what they have is so poorly insulated and structurally unsound, they would be far better off to tear down a home they paid over $400k for..
Eric, you have a beautiful home, worthy of the investment! My thanks to everyone who has contributed to this discussion. I agree that a well built middle sized family house has a better chance of survival than a grand house, no matter how beautiful. And the 22 year drop off came as a surprise to me. That's not the case where I currently live. Here even in more modest neighborhoods land is scarce and expensive, and people maintain and update keeping values high. However I can imagine that might well be the case where land pressure is not so intense. I think the subdivisions of which I was speaking, are absolutely victims of tge 22 year drop-off. No question the school district has affected the value. Many of theses were built when the HS was the most desirable public HS in town, but within about 15 years, it no longer was. What changed? A dynamo of a principal retired, and a downtown HS with 5 magnet HS’s in it got an equally outstanding principal. But the biggest reason was busing. The school district had experienced significant “white flight” when they had a program where all students K- 12th grade were bused across town to schools in very poor areas every other year. K at one school, the next at another school. It wasn’t just racial prejudice which caused this - most parents didn’t want the constant school change and the hour+ bus rides the year tge child was bused out of their neighborhood schools. Parents fled in droves to local private and parochial schools, and many moved further out to a neighboring county. The District was in trouble. So they then started just busing black students across town in order to get the “numbers” right. The US Supreme Court threw out that plan. Back to the drawing board. Now every school is in a cluster with a group of other schools, many at great distance from one another. One is guaranteed a spot in one of these schools, but it may not be the one 2 blocks away. The may not use race but dan use parent’s educational level and income, which in my town often translates into race. The elementary school 2 blocks from DD’s house has no trouble attracting students with lower family education/income. The problem is the schools where the majority of the students are lower education/income families, cannot attract the students from other neighborhood, so those children are just assigned there, and many parents just pull their child out of tge public schools. So parents who bought a house in these lesser subdivisions now had no guarantee their children could attend the neighborhood schools. They didn’t maintain their houses, and when they got too bad, they sold and moved out of the county. In the neighborhoods with better built houses, the parents just stayed but opted out of the public school system or chose a very strong magnet school, if their children qualified. Now, those magnet schools are under attack. They are under the same pressure as NYC’s “elite” public HS’s - not enough black and Latino students. I doubt the people making these policies had any idea how they would affect neighborhoods, but they have. I think if you want to build a lasting building it comes down to one simple principle- don’t skimp. Use good materials- choose wood over MDF; don’t cut corners and cover it with paint and carpet and accessories. There’s a house down the road that’s about 15 years old, owners built it new, but they don’t use their fireplace because it doesn’t draw properly- there’s no excuse for that kind of laziness/cheapness in design and execution and it’s things like that that will limit the usefulness of those buildings over the years. Netflix has an older British show right now about restoring old properties- it was fascinating! Several of the properties were from the 1300s! We don’t have any medieval buildings here so it’s hard to wrap our heads around the longevity of a building like that, but it’s clearly possible. I refer you all to James Earl Jones' character in "Field of Dreams:" "People will come Ray....America has rolled by like an army of steamrollers. It has been erased like a blackboard, rebuilt and erased again...This field, this game, it's a part of our past, Ray. It reminds us of all that was once good and that could be again. Oh, people will come, Ray. People will most definitely come." That movie came out in 1988, and even within it something has changed. As an architect that's done a lot of school projects over the years, blackboards and chalk have been erased by whiteboards and markers, smartboards, and now even smarter smartboards. Human nature seems to be defined by a search for constants, especially as we age. But often the only thing about life that seems constant is a state of change. Preach! Most custom McHomes are so poorly assembled they are doomed for the landfill in the blink of a suburban eye. What a waste. I think some production "track" builds are capable of outliving much of the custom poo which can have more than double the upfront costs. #1 Attractive Architecture. Beautiful architecture is worth saving. Simple and small is easy to maintain. 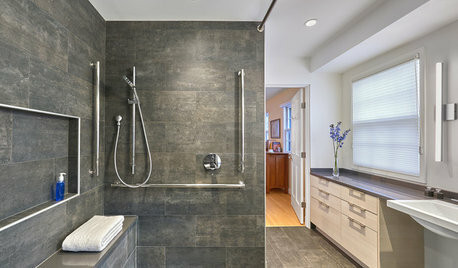 Smaller square footage also allows more attractive and durable finishes. #2 Weatherproofing. 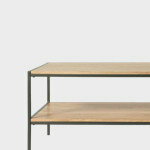 Mainly dependent on design but also finishes and labor quality. Overhangs are the most underrated design tool. Tall ceilings and multi-levels expose walls and windows to more rain and sunlight. A shorter wall home with wide overhangs will be much better protected than those with taller walls and higher ceilings. As with most design, find a good balance. Compared to European offerings, American windows are generally a joke. The only thing worse is how they are installed. Non-existent sill pan flashing and weak air-sealing is typical. 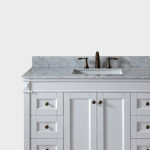 Many excellent Houzz threads and experts to help with selection and install details. Do not rely on most Builders or Architects in this area. Masonry veneer on exterior is best avoided. Love it for hardscape, the bigger and more dry-stacked the better. Generally, masonry craftsmanship is devolving. Pre-Incans out built medieval masons who out built the current offerings of brick veneer, stick on stone and stucco. It can be done correctly but is not cheap. We work with amazing masons but you can't depend on them to properly weatherproof the wood construction behind veneers. Most plans I see from even the best architects, lack good details for longevity of covered up wood. Rather than adding masonry to the back of a three sided McMansion, I predict the most opportunity for renovation will be in tearing off existing McMasonry and repairing all the hidden rot. Install siding on a rainscreen. Most skip this affordable and important detail. Wide overhangs on short walls can substantially extend life of gripes above. Good boots, good hat. If you get the foundation right and use a standing seam or tile roof with zero penetrations (plumbing, vents, chimney, poorly designed dormer) the home could easily go 100 years with zero maintenance. #3 Healthy & Energy Efficient. These two are interrelated. 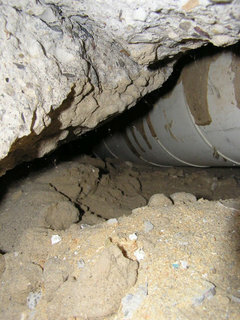 Vented crawlspaces, indoor fireplaces, and air-leakage in construction can rot homes and waste money. These things are hard to fix after construction and is the main reason we prefer building new homes and avoid renovations. No new home should be built without an outdoor-air ventilation system and we are quickly approaching the point that all new homes should be net-zero-energy ready. Hire a third party HERS rater and use Energy Star certification to ensure a minimum level of quality. Springtime Builder, so if someone did want a stone house, what should that person do to avoid the problems you describe, beyond wide overhangs? 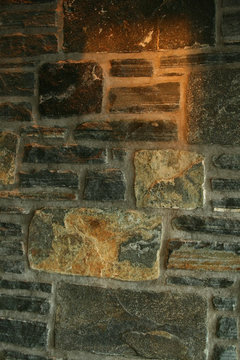 I love real stone and wouldn't discourage a client who's main goals included a stone house. I think avoiding wood walls would be the safest bet. As long as you insulate them well. CMU, poured concrete, ICF or pre-cast concrete panels. Superior walls brand pre-cast concrete is particularly appealing in our area because the franchise is very experienced. They come insulated, pre-cut windows, and install included with brick and rock ledge options. While we haven't done it, some area builders have gone up two levels with them and maybe three? While we are comfortable doing stone over wood it's tougher spelling out the many details for others. Recommended reading would include Harrison Campbell's JLC articles and BSC's The Perfect Wall. If you can get the vapor barrier and drained cavity behind the veneer correct, you're halfway there. Door and window penetrations are where most homes see wall rot so implementing proper sill pan flashing with the exterior weather barriers is the rest of the battle. Homes in earthquake prone areas are more vulnerable and I think drystack styles may do better with a big shake. Thank you! I would not want a stone house here, as I currently live in earthquake country as perhaps you guessed. But that may not always be the case, and I have thought of a stone house someday. Thank you for the articles. Yes, probably. All those charming early-20th-century kit homes were considered suburban blight when they were built, and look, for instance, at the mania for the pseudo-Eames chair, a design which we all understood during its original lifetime to be designed to make you get up and leave and not keep hanging around the waiting area. 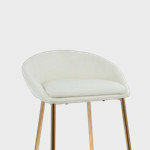 Now they're the number one dining chair design. Go figure. The Victorians lamented earlier in this thread pretty much evoked a response of "Gah!" from those in the know in the mid-twentieth century. "...Homes in earthquake prone areas are more vulnerable and I think drystack styles may do better with a big shake..."
No...not at all...unless the goal is to have all the stone lying on the ground after the shaking stops. Real stone load-bearing masonry, brick load-bearing masonry, and concrete are all rigid materials and do not "flex" well in an earthquake, in which the ground (and all buildings sitting on the ground) move in three directions (the x, y and z axis) simultaneously. Materials like stone, brick and concrete are stong in compression but realitively weak in tension or bending. And...stone, brick and concrete construction are all very heavy, making designing properly engineered designs for seismic zones much more expensive in order to deal with the much heavier materials and forces in play during an earthquake. Wood frame construction, on the other hand, is light weight, has built-in flex and is relatively strong in both compression and tension. Properly designed with roof diaphrams, shear walls, and properly engineered hold-down connectors, wood frame construction is probably the best of all construction types for light building designs in seismic zones. Totally agree about wood, and why I closed with masonry being more vulnerable. Virgils point probably has to do with poor terminology or not enough explanation on my part. Sorry if I've confused and will do best to explain what I meant. Hopefully you could tell my reluctant drystack comment was designed for an escape hatch but I'm not yet ready to climb off the limb quite yet. Like so many things here, it depends on details. It's the veneer application that's in doubt and would love a link on any relative research. It's a tough thing to study with so many variables. The only thing I could find with a quick search was a study of full scale dry stack blocks that concludes with: "The earthquake and harmonic base motion energies were dissipated through inter-brick friction, and in some cases by bricks cracking and crushing. The fact that the bricks were dry-stacked allowed them to move and hence dissipate energy." This was not a veneer but suggests how drystack can perform better than monolithic mortar construction. Outside of veneers, I believe it's widely accepted that drystack walls perform better in earthquakes. The oldest standing structures on earth are dry stacked stone, among the most impressive craftsmanship in Peru and Bolivia, an area known for extreme seismic activity. A good mason friend of mine, turned me onto proper walling as he received his certifications from the Dry Stone Walling Association of Great Britain and did further training in France. 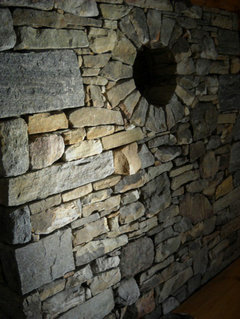 A picture here of one of his "dry stacked style" walls, but listed by him in the mortared work of his website. It uses mortar and clips to tie to whatever kind of wall is behind it. At the time, he tried to talk me into more of a drystack style, not for earthquakes but because the black regency stone required more work and waste to square up. If both walls were subjected to the same earthquake, I think the tighter fitting drystack style would fare better. Assuming both walls had cracking, the one with visible mortar joints would be more obvious. Earthquakes aside, mortar tends to be the weak link. Stone or brick work with no visible mortar will never need to be repointed. Mortar is highly variable and I don't like the many ways that craftsman can screw it up. Commonly available masonry sand is designed to be easy to work with at the expense of longevity. Studying old mortars that are still functional, one will find sharper aggregate varying in size. Got to hand it to Matt Risinger, the man knows when to put out a timely youtube video. Check out his just posted video on a brand new, leaking masonry wall. Things I would highlight relating back to my earlier posts are that rain-soaked masonry can drive moisture to the interior without an actual leak, windows/doors are the major water source and these problems may not become obvious for another 10-20 years. That's a very high-end, presumably architect designed home to be having all that hidden water leakage. Original builder is mostly to blame but I suspect as-built details were not far from plan. Yes, I agree to the point that masonry veneer with no load-bearing properties is another kettle of fish...or another metaphor entirely. I thought the discussion was about true, load-bearing masonry or concrete. If the structural walls behind and supporting the masonry veneer are properly designed and installed for seismic forces, then the veneer can be almost anything since any sort of failure of the veneer has no life threatening potential (unless one is standing adjacent to the veneer in a Richter 7.0 or better). Most cladding, including masonry should be viewed as simply protection for the weather resistant barrier (WRB). The WRB is the real work horse keeping water from getting into the wall assembly. Wood, vinyl and cementitious siding, stucco, masonry will all let water intrude. Good wall detailing will stop the water at the WRB, eliminate weak spots at doors and windows (or any other penetrations in the WRB), and give the water an escape route. Perhaps I'm different, having recently moved off-lot a house from the 40s (Sears catalog!) 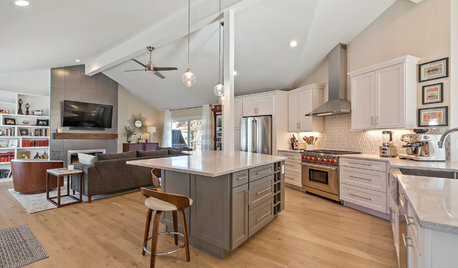 and then affected a one-off, custom home, architecturally designed and custom built. BUT? It didn't;t hurt my heart a bit. It was poorly cared for, added onto without permits etc, Better to turn it away (HEY! House is all fixed up, and is now a low income rental) than to spend the $$$$$$ that it would have taken, to do what is right for the lot. Woo-hoo! End to end city skyline views. Frank Lloyd Wright inspired- solid limestone in a wall throughout. Modern, with flex space. Windows all over. Could have gone for a 4-5 star energy rating, but a total pain. I skipped that, but have the utility bills to prove it. Electric car charging station, on-lot. Ask me how much money I pay in gas- $0. And it costs me maybe-maybe-4$ bucks a month. All that and yet- I'm a realist. 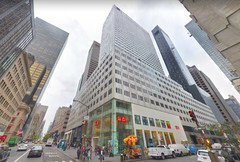 In a private blog, I told the building story. The last post ended with "One day, somebody will pay me a fortune for this....And then they will gut it, to suit their own tastes". I'm ok with that. To each, your own. Unless you have a precious heritage property, do take care how precious you think of it. After all, it's both your home AND an investment. We have given major shots in the arm to both of our houses, extending their lifetimes. The first was a 1950 ranch tract home with plaster walls. We fixed the rot and the causes of the rot and rejuvenated the tired interior. Our current home is a 1978, 1675 sq ft ranch. We learned after living here for six years that the front rooms were falling off. Most of the house is on a basement, but across the front the living room, foyer, laundry, and garage were on a slab, and sinking. When we pulled up the living room carpet and found a false floor hiding a cracked and sunken slab, we knew we were in trouble. 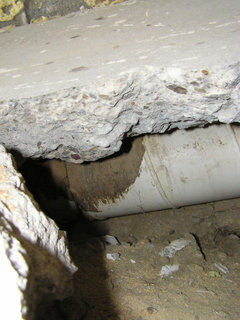 Here are pictures of the underside of the slab through a hole my contractor made with just a sledge hammer. And the holes that were dug in the living room to install piers to stabilize it. Plus one in the foyer and three in the garage. There were already six Ram Jack piers under the front and far side of the living room. The previous owner had given us a letter from the Ram Jack company stating that the piers' lifetime warranty transferred to us, but the company did not say that the previous owner had only installed half the piers that they recommended. Now the front of the house is not going anywhere and we raised the level of the living room to be level with the foyer. It was the "sunken" feature of the living room being 6" lower than the foyer that allowed the previous owner to install a false floor and hide the damage from us. Since then, we have remodeled the bath and a half and widened all the bedroom doors to 36" for accessibility. We will age in place here unless the Michigan winters someday chase us to the South! Our largish lot and big maple trees give this relatively young home a sense of agelessness. With a new roof, insulation, and windows and doors, it can go on for many years to come. We feel we saved this house. Again, it is just a cheap tract home that the builder did not even bother to give ceiling lights in the bedrooms. But now it is buttoned up tight as we could make it and ready for another forty years. I grew up in a pre-1900 farm house where the bathroom and utility room were in an addition, indicating that it did not have indoor plumbing when it was young. It was recently sold after the death of my step mother and flipped. 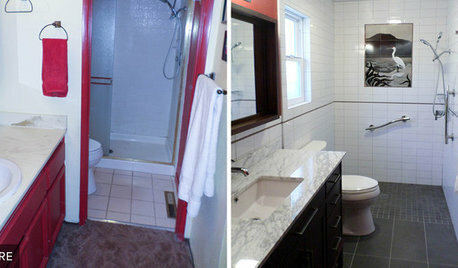 Cheap fixtures in the real estate ad indicate that it will look like crap again in just a few years. My dad was not great with upkeep, though he did put a new foundation under it sometime after I left. It was an odd house, with only one central furnace duct, so that the one upstairs bedroom that had a heat vent could not close its door in the winter time. The small bedroom had a metal grate that looked down into the kitchen for a heat source. This is an interesting topic because our 1969 ranch is 50 years old this year, and I'm planning some maintenance that I hope will last another 30-50 years. Overall, while not fancy, this house is solid and functional. Obviously, some things need to be replaced over time. Our bathroom vanities are both trashed after 50 years of service (and frankly they could have been / should have been replaced 20 years ago.) But I don't see replacing a bathroom vanity every 30+ years as a failure. Will the new cabinets last 30 years? I hope so! Note that we bought our house at its 20 year mark, 1999 (and yes, we got a deal), and our realtor commented -- this is a solid house. I appreciate that comment very much. Although the carpet and lighting, etc. was still very 1969 when we bought it (think carpet in the kitchen!!!) the basement is solid and dry. Build a dream house when you have nothing? Dark exterior or go light?